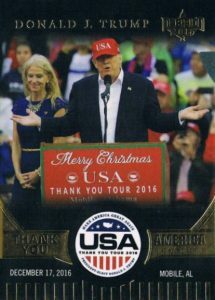 Decision 2016 Series 2 Updated Inaugural Edition sets its sights on the action in Washington, DC with a supplement to the main Series 2 release. The new product mixes in update cards with the prior Series 2 releases at a 1:1 ratio. 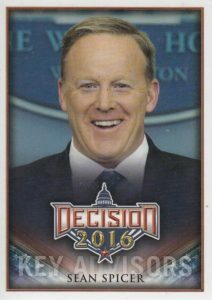 This means that every every box and case should have approximately half Decision 2016 Series 2 Updated cards to go along with the earlier issues. 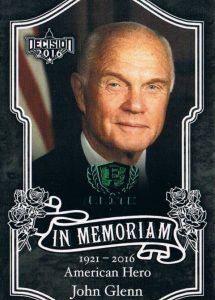 The Updated base set builds on the main Series 2 checklist, starting with card #247. 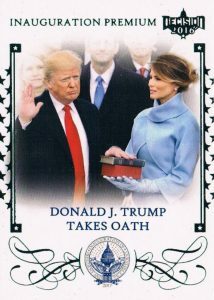 This includes 54 additional cards, with coverage for Donald Trump's cabinet picks, election night, inauguration, and other transition moments. 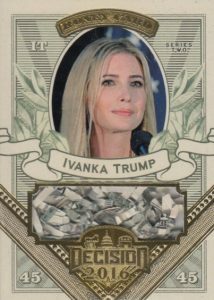 Collectors can also find a fresh assortment of hits in Decision 2016 Series 2 Updated Inaugural Edition. 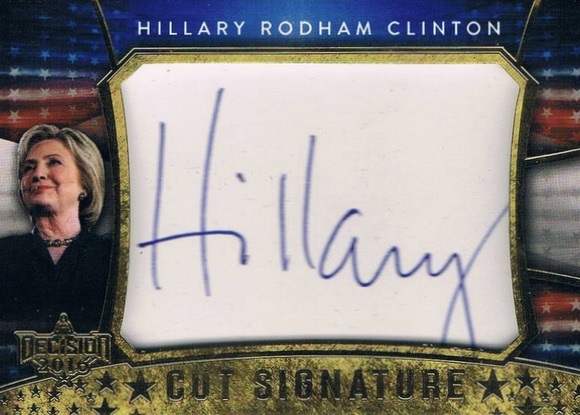 More Donald Trump Cut Autograph cards are inserted along with Blue, Green and Red foil parallels of Series 2 signers. 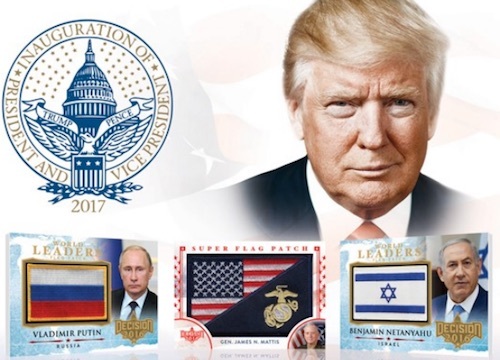 New choices include President Elect and Thank You Tour premium inserts as well as World Leader Flag patches, Party Pals Booklets and Jumbo Box Toppers. 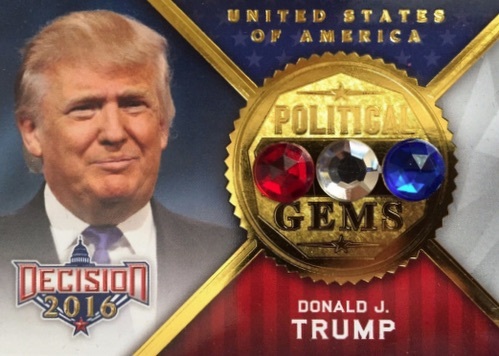 Growing the options for earlier insert lines, Decision 2016 Series 2 Updated Inaugural Edition features more Elite inserts, including Martin Luther King, Jr. and Fidel Castro, and Political Gems, with James "Mad Dog" Mattis. 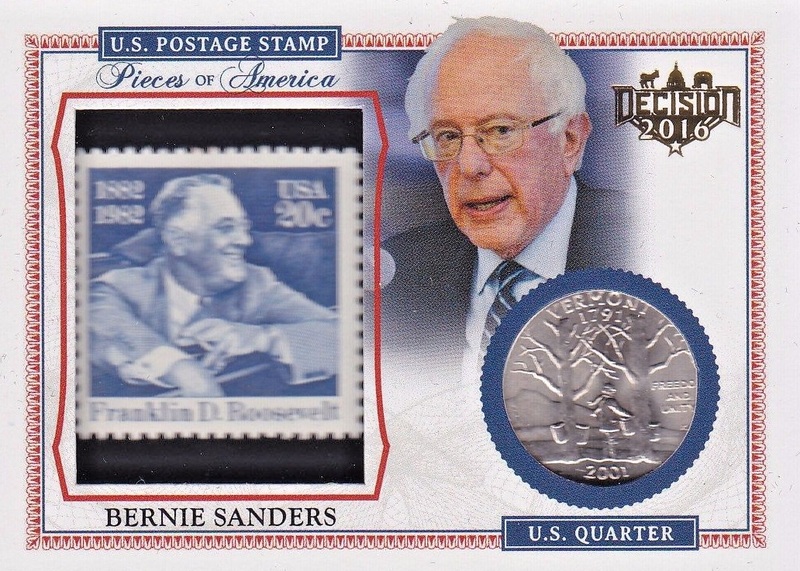 There are also new Money cards and Pieces of America coin/stamp cards, plus Gold Quarter parallels. 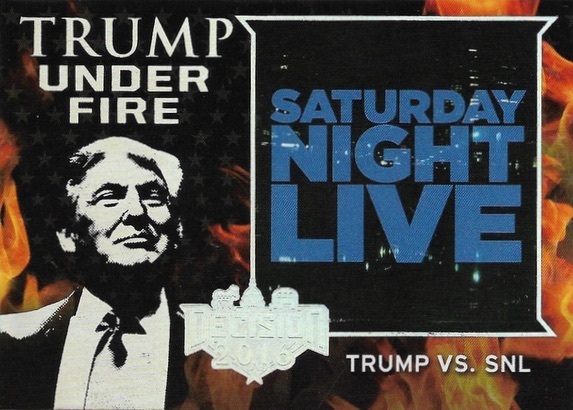 Lastly, the Trump-themed insert is further expanded with additional Trump Under Fire cards. Card numbering starts with #TUF61. 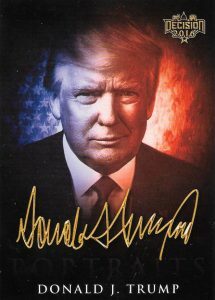 2016 Decision President Donald Trump Signed Cut AUTO Autograph " TOUGH "
284 Wilbur L. Ross, Jr. PARALLEL CARDS: Silver/Gold (Common), Pink (Uncommon), Green (Rare), Blue (Very Rare), Red (Ultra Rare), Ice Blue (Super Rare). CC35 Clinton Foundation Donations Dry Up! 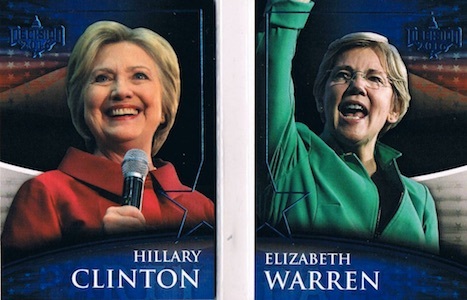 PARALLEL CARDS: Gold (Common), Green (Rare), Blue (Very Rare), Red (Ultra Rare), Ice Blue (Super Rare). 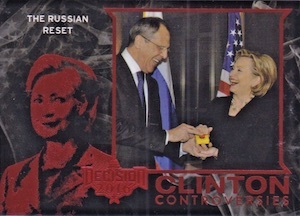 PARALLEL CARDS: Gold (Common), Blue (Very Rare), Red (Ultra Rare). 18 cards. Short prints noted. Shop on eBay. PARALLEL CARDS: 24K Gold Plated Quarter (1:3 cases). 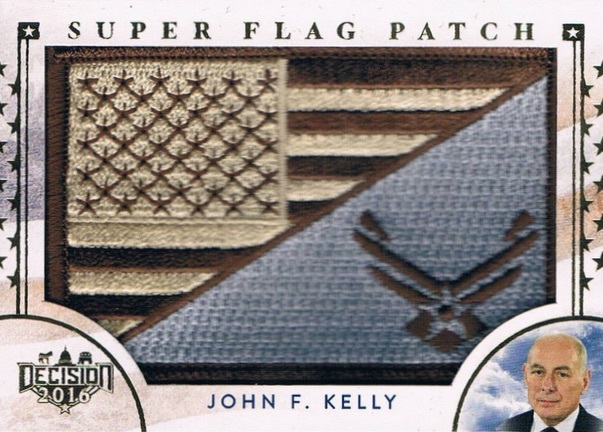 Flag Variations: Reverse USA, USA Army Green, USA Desert Tan, Air Force USA, Air Force Tan, Marine Corp Camo, Black/White USA, Thin Blue Line Police, Thin Red Line Fire Services, 3-Percenter. 22 cards. Short prints noted. 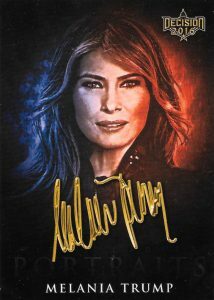 Shop on eBay. TUF76 Merkel and Trump meeting, Tense! 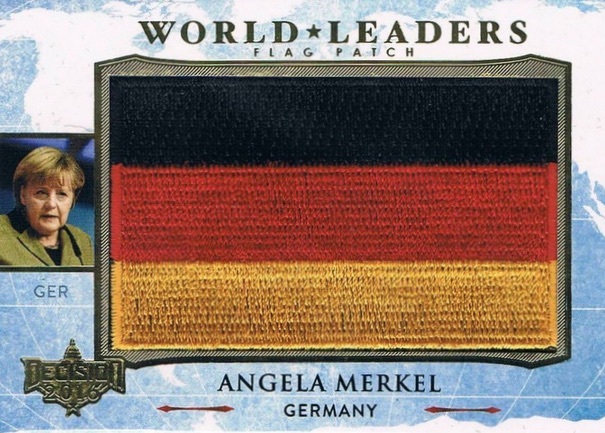 Flag variations include LGBT, EU, NATO, and POW.